Not isure if this means anything but....the kings island website does not have slingshot listed under there attractions. Could this mean they are getting rid of it? It's never been on the site. I was wondering that too. Oh, Well thats kinda dumb. That ride is kind of a waste. Its not worth the cost and from what Ive heard from other people its not that great, but i havent rode it myself. 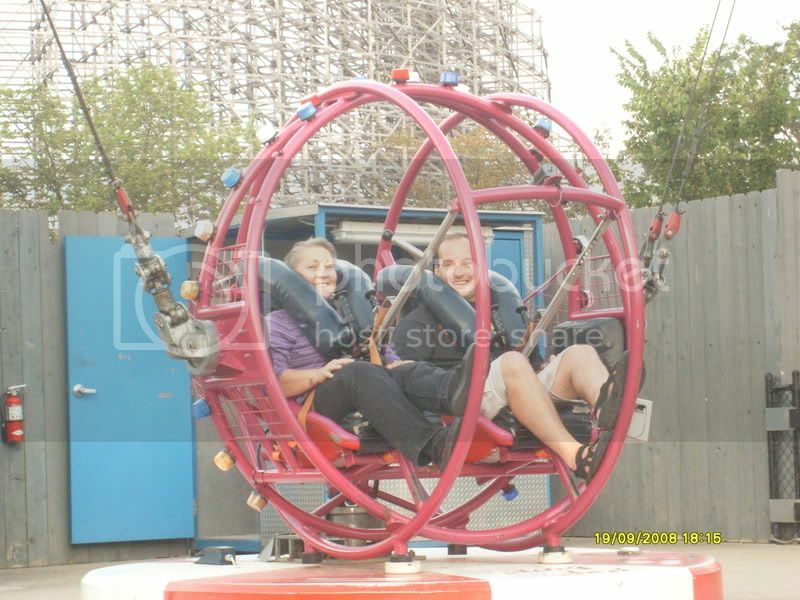 Slingshot is a very fun ride. Well worth paying some money - but I would never pay 20 for it. I would say its worth 10 for sure though. Actually, if you go to Slingshot right when the park opens, it's usually $5, and you can keep the ticket and do it later. That's what I always do. Honestly, I've never been on Slingshot or Xtreme Skyflyer. Thinking rationally (thus, not like I would in the 'perfect KI' thread), I say they tear out Slingshot and put in an Intamin Impulse coaster facing towards the Festhaus. True 'dat, yo. I really regret never getting or taking the chance to ride it. ^ I've been known to have a gangsta side... allegedly. A friend and I before launching.. It was only $5. I only ride if it is $5, because I don't believe in paying to ride after I bought my Platinum. ^Isn't that the woman who was with you that one day we were watching DB's turn around being put together?? Ps, you remember what date that was by any chance?? Klockster, I miss those days. Upon searching my construction database..(LOL).. I discovered the date.